Simple PowerShell Script displays Total and Available Memory . | Chinny Chukwudozie, Cloud Solutions. ← Configuring AD Group Filtering with Microsoft Azure AD Connect Tool. This script is an update to a previous post. In addition to displaying total and available disk space, it will also show the available memory at any given time for a server within a domain infrastructure. 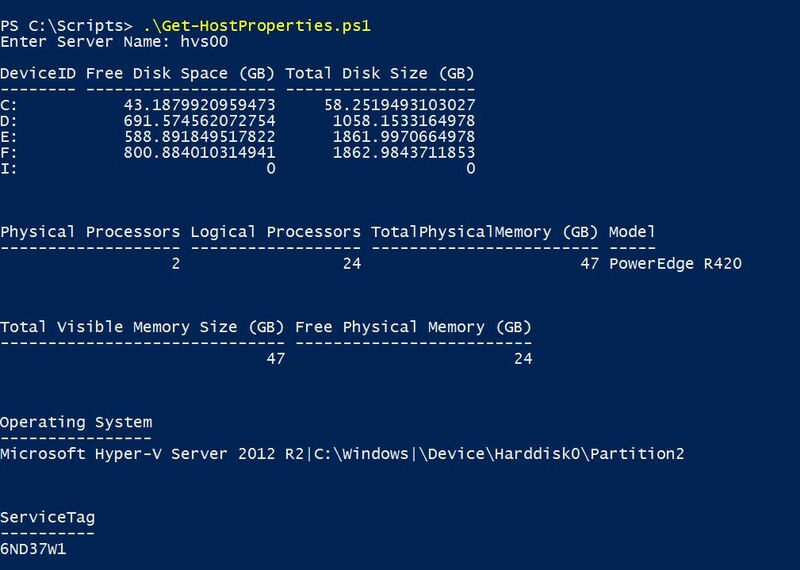 It has come in handy for me when I need to quickly spin up a standalone virtual machine on a Hyper-v host, by giving me a quick insight into the amount of memory available to the Hyper-v host. Using the WMIObject win32_operatingsystem class, I can filter out the TotalVisibleMemorySize property, the FreePhysicalMemory and display them to the console to get a quick look at the resources available to me on a stand alone host or server. The script can run in any Windows infrastructure environment with the appropriate user priviledges and firewall rules enabled. The TotalVisibleMemorySize Data type is: uint64. I mistakenly thought the property is in bytes, but it’s actually in kilobytes as indicated in an msdn documentation:“Total amount, in kilobytes, of physical memory available to the operating system. This value does not necessarily indicate the true amount of physical memory, but what is reported to the operating system as available to it” . The GB and MB are PowerShell constants that convert the original bytes and kilobytes values to gigabytes. The Math::truncate() method simply truncates or chops off the decimal places. This entry was posted in Active Directory Domain Services, AD Forest, Hyper-v, Hyper-v 2012 R2, PowerShell, PowerShell 3.0, Powershell 4.0, Script, Scripts, Windows Server 2012 R2 and tagged FreePhysicalMemory, NumberOfLogicalProcessors, PowerShell Math Class, TotalVisibleMemory, Win32_ComputerSystem, Win32_OperatingSystem, WMIObject Class. Bookmark the permalink.